Watch: Protesters Interrupt Start Of Graham-Cassidy Health Care Hearing During a Senate Finance Committee hearing about the Republicans' last-ditch effort to repeal the Affordable Care Act, it became clear the legislation would not have the votes to pass. Republican Sens. Lindsey Graham of South Carolina and Bill Cassidy of Louisiana defended their namesake health care bill Monday even as the measure ran into potentially fatal opposition from a third Senate colleague. Sen. Susan Collins, R-Maine, came out against the bill, joining fellow Republicans Rand Paul of Kentucky and John McCain of Arizona. That leaves the GOP majority at least one vote short of the 50 votes needed to pass the bill over unified Democratic opposition. Collins' announcement came after the nonpartisan Congressional Budget Office released an analysis saying the bill would leave millions more Americans without comprehensive insurance. The CBO did not have time to provide a precise estimate. CBO forecasts of a spike in the number of uninsured people were a factor in the defeat of earlier Obamacare repeal efforts. Separately, researchers at the Brookings Institution predicted the Graham-Cassidy bill would leave 32 million more Americans without health insurance by 2027. The research firm S&P Global also predicted the bill would leave more people uninsured, cost 580,000 jobs over the next decade, and be a drag on U.S. economic growth. Monday's hearing was immediately interrupted by protesters chanting, "No cuts to Medicaid. Save our liberty." 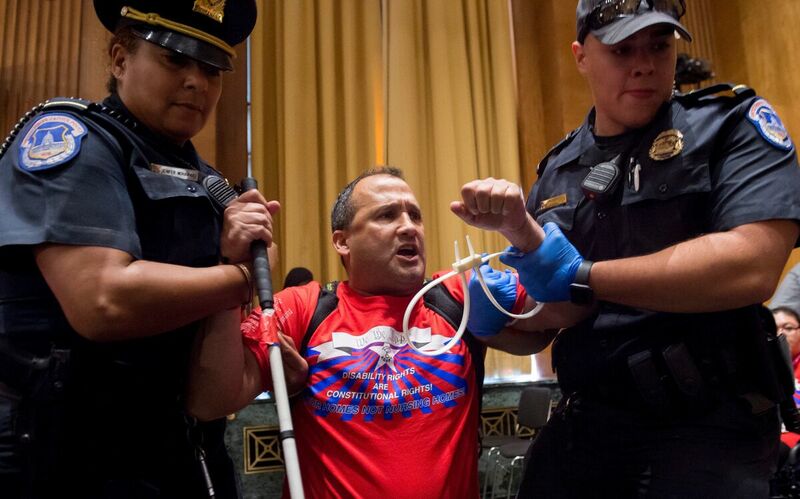 U.S. Capitol Police remove a protester from Monday's Senate Finance Committee hearing on the Graham-Cassidy health care plan to repeal Obamacare. Committee Chairman Orrin Hatch, R-Utah, suspended the hearing for about 15 minutes while the demonstrators — some in wheelchairs — were dragged from the room. "If the hearing is going to devolve into a sideshow or a forum for simply putting partisan points on the board, there's absolutely no reason for us to be here," Hatch said. The bill's authors made changes to the legislation in hopes of winning over holdouts, but that effort appeared to be in vain. Oregon Sen. Ron Wyden, the ranking Democrat on the committee, complained that Republicans are trying to push through an inadequate bill to beat a deadline Saturday and avoid a Democratic filibuster. "Nobody has got to buy a lemon just because it's the last car on the lot," Wyden said. The bill would eliminate federally financed subsidies for people buying insurance on the individual market as well as the Medicaid expansion. Some of that federal money would be repackaged as block grants for the states. "My goal is to get the money and power out of Washington, closer to where people live, so they'll have a voice about the most important thing in their life," Graham said. The bill would also make major changes to traditional Medicaid, capping the federal government's contribution. Over time, federal expenditures on Medicaid could grow more slowly than health care costs, shifting responsibility for those bills to state governments or patients themselves. Graham argued that unless Congress is able to put the brakes on health care spending, it will consume an ever growing portion of the federal budget. The acting secretary of Pennsylvania's Department of Human Services said she welcomes flexibility, but not if it comes with a smaller budget. "Cutting billions of dollars from Medicaid and giving states reduced funding in the form of block grants — funding that goes away after seven years — is not the kind of flexibility that we're looking for," said Teresa Miller. She added such cuts would force governors to make agonizing choices. "Who should receive health care?" Miller asked. "A child born with a disability? A young adult struggling with an opioid addiction? A mom fighting breast cancer? A senior who's worked hard all his life and needs access to quality health care to age with dignity?" The bill would eliminate the requirement that most Americans obtain health insurance or pay a penalty. It would also allow states to ease restrictions on the insurance market, which critics say would lead to higher prices for people with pre-existing medical conditions. Activists and members of the public wait for a Senate Committee on Finance hearing on the latest GOP health care proposal on Capitol Hill on Monday. Once inside the hearing, activists began chanting and temporarily suspended the hearing. "This bill is an all-out assault on vital consumer protections," Wyden said. "It's going to make the health care that many people need unaffordable." He pointed to the wide variety of industry and consumer groups that have come out against the Graham-Cassidy bill, including the American Medical Association, America's Health Insurance Plans and AARP. "You managed to bring together people and organizations in the health care field who rarely agree," Wyden told Cassidy. "I guess congratulations are in order because they all think what you're talking about is a disaster." 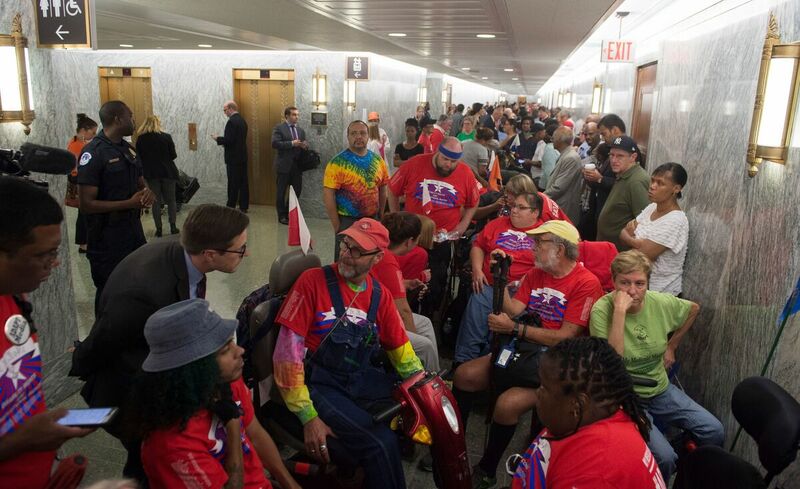 More than 200 protesters had lined up outside the hearing room hours before it started — many arrived as early as 6 a.m.
"If Medicaid is cut so dramatically, it will force people into institutions," said Bruce Darling, an organizer from New York with the disability rights group ADAPT, ahead of the hearing. "For people with disabilities, Medicaid is our life and our liberty," he added.